La Borinqueña has entered the wonderful world of festival food sales! Some of you have already seen me and the crew at some recent street festivals in our Tamale Girl booth. I chose to do these events for two reasons: 1. to promote our restaurant and delicious tamales 2. be the prototype for how a small business might be able to participate in special events without a huge financial investment. I've been asked many times why the food at festivals is always the same. You can almost always find: kettle corn, chicken on a stick, garlic fries, frozen treats, hot dogs, etc. Turns out many of these food booths are professional food concession stands that travel and only do festivals. They don't have a restaurant, are rarely local and do lots of fried food. They have the equivalent of a outdoor commercial kitchen and sanitation is often but not always questionable. They almost always have long lines since their menus are extensive and just a notch down from too expensive. I decided that our restaurant was going to try a new marketing approach and not spend hundreds on advertising that wasn't really effective. Following in the steps of my father aka Tony Tamale, I was going to take my tamales to the people and let them try them first. Then, coming out to La Borinqueña on the edge of Old Oakland didn't seen so far away. It's been an interesting experience putting our booth together and meeting new folks while spreading tamale love during our new adventure. 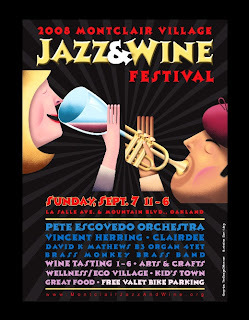 Next date for our booth is just around the corner, Pete Escovedo’s Latin Jazz Orchestra headlines the 6th annual Montclair Village Jazz and Wine Festival on Sunday, September 7 on LaSalle Avenue and Mountain Blvd, Oakland, CA. The festival runs from 11 a.m. to 6 p.m., with more than 20 premium Northern California wineries pouring tastings starting at 1 p.m. Bring the whole family: the younger set will enjoy rides and games at Kids Town; music lovers will hear from saxophonist Vincent Herring, Brass Monkeys Brass Band, singer Clairdee and organist/pianist David K. Mathews; arts and crafts aficionados can check out wares from 40 vendors; wellness and green champions will get plenty of inspiration in the Wellness-Eco Village; and food vendors will be ready to tantalize your palette. Admission is free, valet bike parking is free, wine tasting packages are $30 for one, $50 per couple. For more details, and to print a $5 discount coupon for wine tasting, visit www.MontclairJazzAndWine.org. Stop by and say ¡Hola!